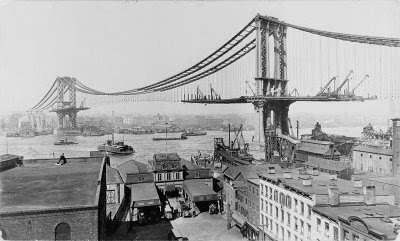 The building of the Manhattan Bridge a century ago. Tipsters inform CCRC that Sam Schwartz, better known as "Gridlock Sam" is scrounging for dough on the Chinatown side of the Manhattan Bridge. He's looking for funds to support the centennial celebrations for the Manhattan Bridge scheduled for Summer of 2009. The news has already angered families of the victims of vehicular fatalities at the entrance of the Manhattan Bridge at Canal St. and Bowery. Celebrations are premature despite the bridge's birthday they say, so long as the extremely dangerous intersection at Canal and Bowery remains a death trap. So far in the past 10 months at least 5 deaths have resulted from car accidents at the entrance to the Bridge. Where was Sam when Chinatown advocates were screaming at the DOT for signage, and added measures to slow traffic coming off the Bridge, in the last several years? It's a slap in the face of the victims and the pedestrian safety advocates in Chinatown. News media in Chinatown have been reporting on grassroots pedestrian advocacy spawned from within Chinatown for years, yet there is no additional signage and no traffic calming measures for the intersection. As of yet there are NO PLANS TO ADDRESS this very dangerous intersection, just celebration. Participants who wish to celebrate at the location of the deaths of five Chinatown individuals can contact Sam Schwartz who is currently soliciting funds from Chinatown. The Chinatown Community Benevolent Association, with president Justin Yu at the helm, may also be contacted. Be sure to wear your party hat. Let them know that you would like to participate in the celebrations while families in Chinatown continue to mourn the violent deaths of their family members. Let Sam and CCBA know that you will be sipping champagne and posing for photos along with them, while you ignore the danger that persists at the entrance of the Bridge.